Hsp90 inhibitors are well characterized in relation to their effects in a variety of tumors, with several inhibitors in various phases of clinical development. In recent years, the same inhibitor classes have been tested for efficacy in other systems, such as Alzheimer’s disease and a variety of infectious disease models, including fungal and parasitic targets. 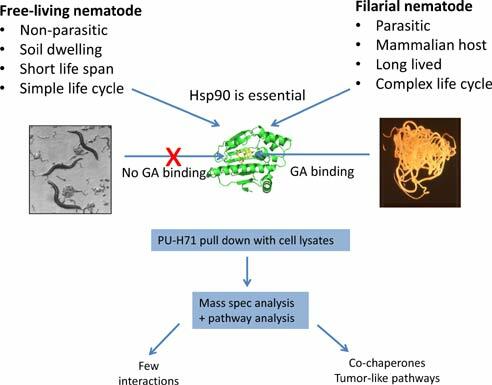 In this article we discuss the repurposing of Hsp90 inhibitors for parasitic disease with a focus on parasitic nematode infections. We summarize the data that indicate that Hsp90 is functionally diverse in different nematode species and we discuss the challenges and prospects for developing these inhibitors as next generation chemotherapeutic tools. Parasitic nematode, Brugia pahangi, Caenorhabditis elegans, Drug resistance, Hsp90 inhibitors. Institute of Biodiversity, Comparative Medicine and Animal Health, University of Glasgow, Garscube Estate, Bearsden Road, Glasgow G61 1QH, UK.